As a novelist, Nicholas Sparks has never met a character he hasn't wanted to murder. Simply put, the man has a penchant for cutting short relationships and turning smiles upside down to destroy happy endings with a few clicks on his keyboard. And even without giving his latest endeavor the spoiler heavy title of The Last Song, within the first five minutes of the film you're already guessing which individual will be deleted by the final credits. Luckily before we get too emotionally attached, it's pretty obvious given the film’s set-up that finds two kids (Miley Cyrus and Bobby Coleman) being driven to Georgia to spend the summer with their estranged father (Greg Kinnear) who coughs suspiciously at least twice in the first act. Alarm bells, anyone? Unlike mysteries that inspire you to sleuth out the suspect, Sparks' melodramas encourage you to identify the victim in the quest for tearjerker success. By now he's become a genre all his own considering the montage heavy moments punctuated by pop songs, beautiful beach set sensuous fests in the south as the male answer to Danielle Steel, publishing variations of his breakthrough novel The Notebook for over ten years. Assuredly this has resulted in cinematic highs (Dear John, Message in a Bottle) and movie lows (Nights in Rodanthe which prompted me to stage an online intervention), mostly Sparks' work falls right into the middle as benignly pleasant Hallmark Hall of Fame style family dramas seasoned with second chances and a side of unexpected love. 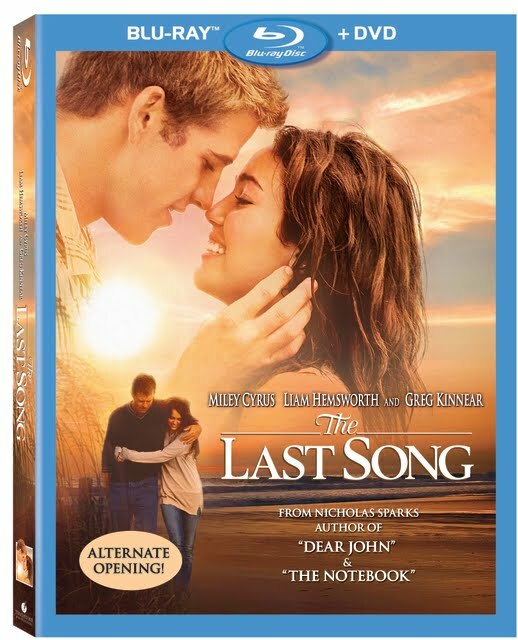 The Last Song easily falls into the middle category as a slightly awkward but nonetheless promising adult star vehicle for Miley Cyrus, who, hoping to put Hannah Montana behind her to show her improved range as a performer sought out a generational crossover picture in the vein of Mandy Moore’s Sparks cry-a-thon A Walk to Remember. Having given up the piano around the same time that her parents' marriage fell apart and her father (Kinnear) moved back to Georgia, Cyrus' rebellious musical prodigy Ronnie grudgingly ventures from New York City along with her younger brother Jonah (Coleman) to spend the summer with their father. Despite a passion for classic Russian literature and for protecting baby sea turtle eggs from being attacked by raccoons on her dad's beachfront property, the angry vegetarian with a shoplifting record keeps up the tough act for as long as she can. Of course, it's summer in a Sparks screenplay after all so, following a “meet cute” consisting of the go-to romantic contrivance of the “bump into” when Ronnie's love interest crashes right into her only a few minutes after her Doc Martens hit the sand, eventually the volleyball playing mechanic manages to melt her icy exterior. To this end, it comes as a surprise to no one with a pulse that Australian actor Liam Hemsworth's good-natured Will will be the one to show up on Ronnie's property to help her save the baby turtle eggs from harm. However, Sparks impresses us all the same with one of his most creatively written romantic scenes in recent onscreen memory as the two teens guard the eggs all night, taking turns chatting and sleeping in their lawn chairs in a beautiful twist on a first date that puts most teen and tween friendly movies (including some 2010 adult romantic comedies) to shame. Unfortunately from truck sing-alongs to mud-fights and family misunderstandings spawned by prejudice and economic differences and parental expectations, the rest of the romance between Ronnie and Will goes through entirely familiar terrain. Nearly abandoning all traces of the original premise of trying to reconnect a father with his children in favor of a teen romance, ultimately the film is bogged down by too many subplots that are unable to be given the attention they deserve in the limited running time. An inauspicious and slightly sloppily edited effort from first time feature filmmaker Julie Anne Robinson, The Last Song shortchanges not only the relationship between the father and his teenage daughter (aside from one forced heart-to-heart exchange) but also thanks to Sparks' inclusion of a church fire mystery adds another uneven element into the overcrowded work. While it's a structural mess, the always solid Kinnear manages to add poignant dignity and tenderness to his underwritten role. And even though this Song is a step down from Sony's unexpectedly excellent recent adaptation of Sparks' Dear John, Cyrus' mature debut sans Hannah Montana is augmented by its beautiful lensing and solid technical specs in a flawless Blu-ray transfer.